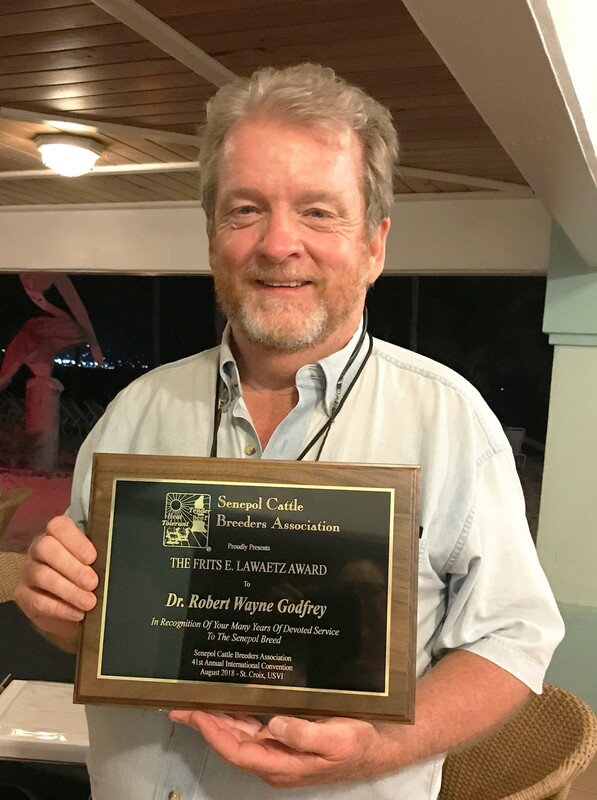 FREDERIKSTED — Robert Godfrey, Director of the Agricultural Experiment Station and Professor of Animal Science, received the Fritz E. Lawaetz Award at the 2018 Senepol Cattle Breeders Association meeting held on August 8-11, 2018 on St Croix. Godfrey’s award, named after former senator and early pioneer on St. Croix for the Senepol breed: Fritz E. Lawaetz, recognizes his many years of service to the Senepol cattle breed. Through Lawaetz’s work as one of the early forerunners on St Croix he helped establish the Senepol breed and make it an internationally recognized tropical breed of cattle. Godfrey is truly humbled to receive this award and made sure to acknowledge that he has had a lot of help over the years conducting research on the Senepol cattle. The honor of Fritz E. Lawaetz Award is shared with Henry Nelthropp, Adam Weis, Whitney Preston, Christy Ketring, Sue Lakos, Willie Gonzales and Jose Torres. Since 1998 Godfrey’s research program has received funding from the United States Department of Agriculture (USDA) National Institute of Food and Agriculture to evaluate external parasite burdens, heat tolerance and adaptation to the tropical climate, production traits and temperament of Senepol cattle. UVI has been doing research on the Senepol cattle under the guidance of Godfrey since 1995. In 2006 the Gasperi family donated a herd to the university for research. The UVI herd is registered with the Senepol Cattle Breeders Association. Godfrey first worked with cattle at Kansas State University, then later in graduate school at Texas A&M University. At UVI, Godfrey’s research specialties include reproductive physiology, cattle, sheep, environmental physiology, production agriculture, genetics, and sustainable agriculture. The Agricultural Experiment Station, Animal Science Division managed by Godfrey, aims to conduct basic and applied research geared towards increasing production and improving efficiency and sustainability of livestock production in the tropics. Through his research, Godfrey hopes to develop the Senepol farm to better manage the cows and the land. To do this, he plans to increase the fencing quantity and quality, and develop better water and grass management, which will hopefully lead to an increase in herd size from its current status of 58 mother cows. The Senepol is a breed of cattle that was developed on St. Croix in the early 1900’s. It is a tropically adapted Bos taurus breed that was developed by crossing N’Dama cattle from Senegal with Red Poll. The Senepol was selected for its ability to perform well under the environmental conditions found in the Caribbean and local ranchers have developed both a domestic and international market for these animals. The cows have good maternal traits, and both bulls and cows are naturally polled and have a calm temperament. In 1977, a plane carrying 22 Senepols left for the U.S. mainland and 35 years later the Senepol Cattle Breeders Association (SCBA) recognizes breeders from many countries and more than 60,000 animals in its database. Today, Senepols can be found thriving in 8 states in the United States and around the world in such countries as Australia, Brazil, Paraguay, Columbia, Argentina, Panama, Dominican Republic, Ecuador, Nicaragua, Puerto Rico, Venezuela, Mexico, Costa Rica, Phillipines, South Africa, and Zimbabwe. In 1940, Sen. Fritz E. Lawaetz became the general manager of Estate Annaly. He later developed it into the 1,500 head strong Annaly Farms. He soon after founded the Virgin Islands organization that would eventually became the internationally recognized Senepol Cattle Breeders Association.